Poison Spyder Bombshell™ Diff Covers are designed to protect your gears, lockers and diff cover bolts from the most punishing rocks and trail hazards. The stock covers your Jeep came with are weak, stamped sheetmetal. Even a moderate tap with a rock can cave it in against your ring gear, causing potential damage to the gears, locker and carrier bearings, not to mention a difficult, messy trail fix. Even more common, though less catastrophic, is "peel back" that can occur when sliding over a rock causes the lip of the cover to peel up, allowing your gear oil to drain causing a hazard for both your Jeep and the environment. The Bombshell™ Diff Cover is your best insurance against each of these hazards. The Dana 30 Bombshell can now be used on STOCK Jeep Wrangler JK and TJ, front or rear axles, with no requirement for aftermarket track bars or suspension modifications! Now you can install the Bombshell Dana 30 Diff Cover on to your bone stock Jeep, straight off the showroom floor! This re-design also includes moving the gear oil fill hole to the stock fluid level height so there's no more research, guesswork or measuring—simply fill the diff to the level of the fill hole. The Bombshell™ differential cover is cast from highly ductile nodular iron—the same material drag racing differential housings are cast from to handle thousands of horsepower. The design of the Bombshell™ incorporates recesses to protect the diff cover bolt heads from trail damage, while the profile of the Bombshell™ acts as a ramp to help slide your Jeep up and over the most troublesome pumpkin-eaters. The ramp profile also results in an extremely thick& up to 1" thick—cross-section around the bolt ring, where contact with the rocks is most likely. Throughout the rest of its cross-section the Bombshell™ is the thickest cast differential cover on the market, from 7/16" to a brutal 1/2" thick at the outermost surface. Installing the Bombshell™ is fast and easy. Click the icon at left to view our Install Instructions, and view the video on the right to see the installation process. The sealing surface has been CNC machined flat for a perfect seal. Poison Spyder provides a tube of silicon sealant and new Grade 8 hardware so you'll have everything you need except for tools and gear oil. Bombshells are shipped either bare so that you may powder coat or paint to suit your own preference, or powder coated semi-gloss black. NOTE: many of the photos below show where the customer has painted the raised area of the Spyder logo a contrasting color. This is NOT done by Poison Spyder—our powder coat option is just a single color (all black). High Ductile Nodular Iron This is the same material high stress items like drag racing rear end cases are made of—the famous Ford 9" N cases are nodular iron. High ductility means that this material is less likely to break on impacts compared to more brittle materials such as normal cast iron. Ramp Profile The profile of the Bombshell™ slants continuously toward the outside edge of the bolt ring, in effect forming a "ramp" that helps the vehicle slide up and over rocks rather than snagging on them. Some competing diff covers curve inward to the inside edge of the bolt ring, creating a step or ledge around the outside edge of the cover that can more easily snag on rocks, impeding forward progress. The ramp profile also results in an extremely thick outer edge, around the bolt ring. At up to 1" thick, this extra material is absolute protection agains "peel back"
Peel Back Protection The ramp profile of the Bombshell™ also results in an extremely thick outer edge, around the bolt ring. At up to 1" thick, this extra material is absolute protection agains "peel back"—the condition that can happen when sliding over a rock in the reverse direction (or forward, in the case of the rear diff), when the rock wants to grab the lip of the cover and peel it back, draining your oil and leaving your gears high and dry. 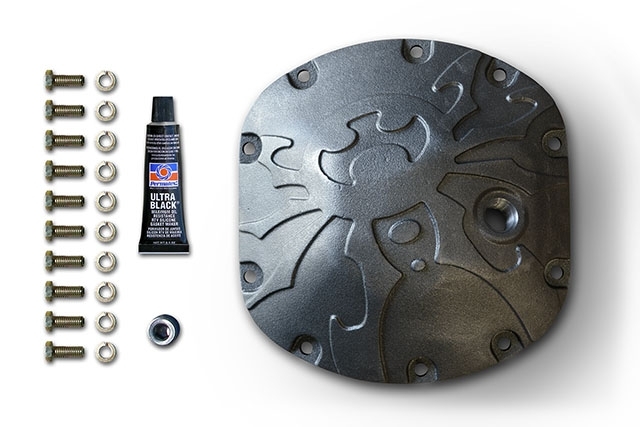 Extra Thick Throughout The Bombshell™ cover is the thickest cast differential cover on the market, ranging from 7/16" thick to over 1/2" thick (not counting the bolt ring area, which goes much thicker). This thickness is your best protection against the rocks caving it in and damaging your internal differential components. CNC Machined Mount Surface The mounting surface of the Bombshell™ has been CNC machined flat for a positive seal, even without using a gasket! An effective, leak-free installation may be made using just the provided silicon sealant. Fill Hole at Stock Level Previous versions of the Bombshell Diff Cover had the fill hole located higher on the cover to allow for intentional over-filling at the owner's discretion, or to accomodate for rotated axle housings. This resulted in confusion over the proper amount of fluid to use. With this version of the Bombshell Diff Cover, the fill hole has been moved to the level of the fill hole on stock covers so that it may act as the fill level indicator. No more research or measuring—simply fill the gear case to the level of the fill hole regardless of locker/carrier. Raised Spyder Design The raised Spyder design on the Bombshell™ Diff Cover identifies it as a Poison Spyder product, with the top notch quality and backing that comes along with it. But its more than just a cosmetic feature—the raised portions of the Spyder logo push the thickness of the Bombshell™ up to an outrageous 1/2" thick! The Spyder also provides many opportunities for customizing, as owners can choose to paint the Spyder body color—or any other contrasting color—or black it out and highlight the rest of the cover. Complete Kit The Poison Spyder Bombshell™ comes as a complete kit, with everything you need to install it except for tools and gear oil. Quality Grade 8 bolts and washers are provided, as well as high grade silicon sealant. The machined mounting surface of the Bombshell™ allows for a gasket-less install using just sealant. Q: Can the Dana 30 Bombshell be used on a STOCK Jeep Wrangler? A: This is a newly re-designed version of the Bombshell that is designed to fit all Jeep Wrangler applications, even those without suspension modifications. In other words, it will fit on a bone stock Jeep Wrangler right off the showroom floor. Earlier versions of the Dana 30 Bombshell did require an aftermarket Track Bar to ensure there would be no contact on full compression. Q: How much gear oil should I use? A: This version of the Dana 30 Bombshell has the fill hole located at the proper fluid level. Simply fill it to the level of the fill hole for the correct quantity of lubricant. This quantity will vary slightly depending on the amount of oil displaced by different types of lockers/carriers, but filling to the level of the fill hole always result in the proper amount. Q: What brand or weight of gear oil should I use? A: Different differentials and lockers require different grades of oil. We will defer to your vehicle or locker manufacturer's reccomendation of what oil to use. Consult your owners manuals or call the manufacturer. Q: Do I need to use a differential cover gasket? A: With the machined mating surface of the Bombshell™ , the use of a gasket is optional. It will seal properly with only a bead of silicone sealant, if correctly applied. That's why we include a tube of sealant, making this a complete kit. Alternatively you may use a gasket if you prefer. Q: Will the Bombshell™ work with my aftermarket suspension system? A: Poison Spyder Bombshell™ Diff Covers are not compatible with some aftermarket suspension systems whose track bar mounts or other components attach to the diff cover bolts, such as those manufactured by Skyjacker and Full Traction. The recessed bolt head design of the Bombshell™ interferes with these systems. Painted it up and installed it last weekend to protect a new locker. Slammed it into a bad rut this weekend with no damage to it or my differential. Looks great under the front end too. OUTSTANDING! I couldn't be happier with the Dana 30 Bombshell differential cover for my 99 Grand Cherokee. The quality is great! well i cant say that i have seen any other diff cover on the market that is this thick and still remains sleek, smooth and not leaving that overly bulky look. machining was perfect. I purchased the Poison Spyder Bombshell Dana 30 Diff Cover for my 1999 Jeep Grand Cherokee. This product is well made to withstand severe impacts keeping you moving on the trail. I will be purchasing another one for the rear diff, Dana 44, to ensure they are protected by the best and toughest brand in the industry. Highly recommend this product for the best protection where it counts.